A Caribbean vacation should be all about you. It's your time to relax, unwind and spend quality time with loved ones. We include the finest for you and yours. From amazing dining choices that allow you to decide where to go and when to go, to accommodations that put all creature comforts to bed, we make sure every detail turns your happy days into magical nights... And now, for a limited, you get more of it for free. *Free night offer applies only to adult rates, (children do not receive the free night). Valid for new bookings of 7 paid nights for travel on specific dates. See resorts' offers for more information on book by dates and travel dates applicable to select room categories. Maximum 2 person limit for offer. 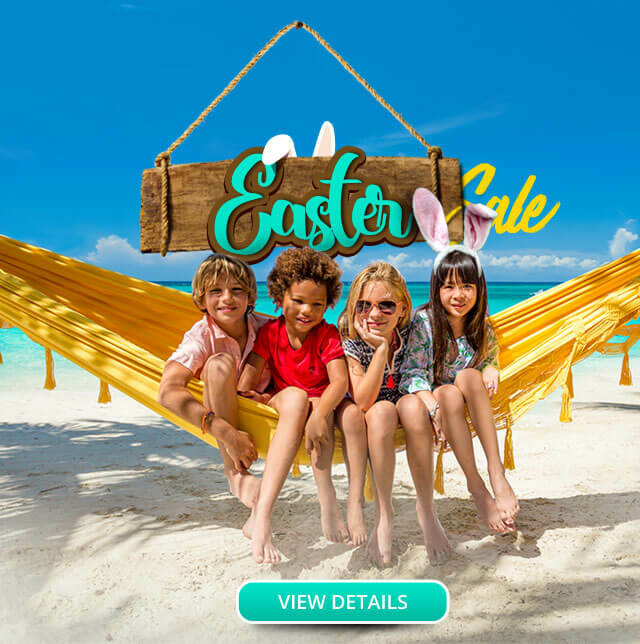 Promotion is combinable with Beaches consumer savings for Single Parent Fun Months, Sandals Select points and Free Weddings where applicable. Offer is not combinable with any other free night promotions or resort's credit nights. May not be applicable for group bookings. Offer can be changed or withdrawn at any time. **Although certain flight choices are not eligible for this offer and must be paid in full at time of booking, the land portion of your tropical vacation can always be held for $98 per room if booking at least 45 days prior to your departure.